All meetings held from 11:30 am- 1:30 pm at the Mountain City Club. A panel discussion with three of our areas newest nonprofit leaders, Maeghan Jones from the Community Foundation of Greater Chattanooga, Lesley Scearce from United Way of Greater Chattanooga, and Cathy Barrett of the Community Foundation of Cleveland and Bradley County. The participants will share their vision for these three important organizations under their leadership. The panel discussion will be moderated by Jennifer Nicely, Foundation President at Memorial Health Care Systems. Allison will discuss how best to get a planned giving program started if you don’t already have one and for those who do, she will discuss the wave of baby boomers passing their life saving to heirs and their favorite causes. That’s $30 trillion that’s going be given away! Dr. Donna Van Natten synthesizes her education, knowledge, and expertise into high-octane, interactive, and fun body language and communication programs that provide new insights and tools about human behaviors for all professions, ages, and stages of life. Her body language presentations cross a myriad of audiences, including corporate teams, community-based organizations, and keynote engagements at national events. She is a savvy business owner who excels in both the spoken and written word. Dr. Wagner will discuss how a "one size fits all" strategy is not effective when it comes to philanthropy and fundraising in today's diversified environment. Her presentation, based on her just published book, Diversity and Philanthropy: Expanding the Circle of Giving will highlight how nonprofit leaders, board members, staff, and volunteers of nonprofit organizations can better reach diverse populations and incorporate perspectives that increase success. Currently Lilya Wagner is director of Philanthropic Service for Institutions, a trainer for The Fund Raising School as well as on the philanthropic studies faculty of the Lilly Family School of Philanthropy at Indiana University, and teaches in the graduate program at St. Mary’s University in Minnesota. Building a board that will have impact and that will actually assist you with relationship building and fundraising is key to the success of every nonprofit. However, few nonprofit leaders know how to build a great board. In today’s fundraising climate, having a great board is integral to philanthropic and organizational growth. This interactive session will share ideas on identifying, recruiting and keeping trustees. Also, we will discuss how to keep them motivated and engaged. Ken Turpen, President with Turpen & Associates, is also a Vice President at Thompson & Associates, and Principal at Jerold Panas, Linzy & Partners, is a senior foundation executive of five nonprofit organizations during the past 25 years and consultant in secondary and higher education, and healthcare fundraising. He has unique insights into nonprofit boards, CEO leadership, management, community activism and donor perspectives as his career has brought him opportunities to excel in each of these areas. Ken has expertise in estate planning, planned giving, capital campaigns, major gifts and annual giving. Matthew provides strategic direction for CSU System leadership in engaging various communities through events and partnerships, with a particular emphasis on the Denver area. Provides oversight for Presidential events and manages the Chancellor/President’s participation in events sponsored by CSU System member institutions – CSU, CSU-Pueblo and CSU Global Campus. He also provides leadership, strategic and creative direction to the Office of CSU Events & Donor Engagement (Fort Collins). Matthew also continues to work with Lynne Wester at the Donor Relations Guru, a consulting and facilitating collaborative founded by Lynne in 2010 where, prior to joining CSU, he was a Consultant and Partner Member. The Donor Relations Guru Group specializes in many areas of fundraising counsel and support. Members are available for on-site consulting, conference presentations, retreat facilitation and recruiting and talent development. Over the years, Karla’s work as a consultant, teacher, author and speaker has inspired organizations across the country to accomplish unlimited goals with limited resources. Her students and colleagues have been inspired by her keen sense of the donor environment, her propensity for challenging assumptions, her principled participative leadership philosophy, and her unique classroom levity. Karla is an organizational consultant with more than 35 years of professional nonprofit leadership. Her firm, THE WILLIAMS GROUP, has assisted over 300 nonprofits to develop strong donor focused cultures. Jenny specializes in strategic leadership, business innovation, and focused change. Her background as a global director with Ernst & Young Management Consulting combined with her certifcation in IDEO’s design thinking methodology give her a unique approach to strategy. Jenny will lead AFP in an overview of strategic planning tools for innovators. 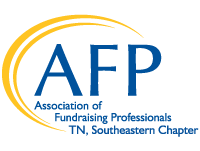 These tools will be ideal for you to take back to your organization and it will also help us move our AFP chapter forward over the next few years. Come to learn but also to share your vision, feedback, insights, and talents with the group!